"Learning the notes on the guitar is a pain", said every guitar student I've ever met. Yes, it's not the funnest part of learning guitar, but it's one of those things that you really need to do as you progress as a guitarist. Without learning the notes on the fretboard, you eventually get stuck at a certain level, and your progress will be impeded. This is especially true for people who want to learn improvisation. While there are a few methods that make learning the notes a bit easier, like these 5 tips, and understanding the tonal relationship between the guitar strings, there are a few products that can help you learn those notes. I found this note map as I was searching for a way to help a student, who was desperate for some assistance in learning soloing. He was having a hard time remembering where each note was. This is how I came across the Don't Fret Note Map. Once you've made the decision to start learning guitar, the first step will be to actually get one. At first sight, guitars have mysterious specifications and technical jargon that you won't be able to comprehend, so it can be a daunting process for a beginner who doesn't have a clue about anything guitar related. To make things a bit simpler for you, here are some tips on buying the best first guitar. Electric Guitar vs. Acoustic Guitar – Which is Better for Beginners? One of the most common questions I get from new guitar players is to answer the epic question once and for all, and decide whether it is "best to learn on an acoustic guitar, or an electric guitar, and to start with electric guitar lessons or acoustic guitar lessons". First of all, the second part of the question is flawed. If you are a total beginner, you don't need to differentiate between lesson types yet, since at this stage, you are still just trying to learn very basic techniques, which are the same for both types of guitar (check out our free basic guitar lessons). Now back to the original question of whether learning on an electric or acoustic is more suitable for beginners. This is a very interesting question that causes many disagreements between us, guitar teachers as well. There are advantages and disadvantages of learning on either type of guitar, so I will try to list them all, and after you get a chance to read the pros and cons of both sides. I'll give my opinion as well, but don't skip forward, please. Read the article in full, I want you to see things objectively before you hear my subjectivity. Let's start off with the differences between the 2 types of guitar, as the pros and cons derive from here. 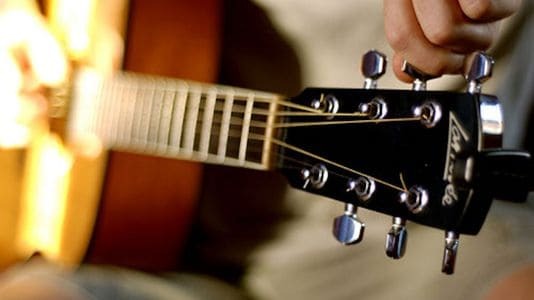 What are the differences between acoustic and electric guitars? As a newbie to the world of guitars, you may be wondering just how are electric guitars different from acoustic ones. Body Solid body which requires electric amplification to produce sound. Hollow body. The vibration from the strings vibrates the entire guitar. The resonation is passed into the air inside the body, where it resonates and is naturally amplified to become sound, which exits through the soundhole. Size and weight Generally smaller, but much heavier than acoustic guitars. Larger than electric guitars, because the body has to be relatively larger for the sound waves to get amplified. However, they are usually lighter, since they are hollow. Neck Usually slightly thinner, strings seem closer together. Usually a bit thicker, strings are further apart. Classical guitars have even wider necks. Strings Thinner, lighter steel strings, easy on the fingers. Strings on electric guitars don't need to be heavy, because the sound is amplified. 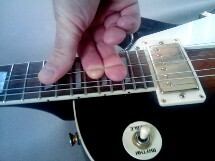 The thin strings make lead guitar techniques, like vibratos and bends easy. Heavy steel strings that need to vibrate stronger, therefore they are harder to hold down. Lead guitar techniques are difficult to carry out. Lighter nylon strings are also used on acoustic guitars, which are easier to play, but have a more subdued tone. String action Since the strings are thinner than on the acoustic guitar, they don't need that much space to resonate. Because of this, the string action can be set lower, meaning the strings are closer to the neck. This makes them easier to fret. The thicker strings on acoustic guitars need more room to vibrate, so they are a bit further from the neck. This makes them harder to hold down. Tone Thanks to the multiple pickups, the tone and volume knobs on the guitar, plus the effects you can apply with an amp, the tonal possibilities of electric guitars are endless. Acoustic guitars without amplification have a single tone. There are tonal differences between the different acoustic guitars as well, which depends on the materials the acoustic guitar is manufactured with and the size of the guitar. Music Since electric guitars are amplified and effects are added to create a final tone, you can basically play any type of music with them (other than classical and folk). The lack of amplification limits the use of acoustic guitars to music where the clean acoustic tone sounds good. These include country, classical, blues, pop, folk. https://www.theguitarlesson.com/wp-content/uploads/the-guitar-lesson-logo.png 0 0 Tom - TheGuitarLesson.com https://www.theguitarlesson.com/wp-content/uploads/the-guitar-lesson-logo.png Tom - TheGuitarLesson.com2018-06-20 08:16:182019-03-20 13:26:18Electric Guitar vs. Acoustic Guitar - Which is Better for Beginners? Strings Going Out of Tune After a String Change? After changing guitar strings, you will find that your strings get out of tune very easily for about 1-2 weeks, depending on how much you play and how often you retune. This is due to the fact that new strings stretch, causing them to go out of tune very easily. I want to share a little secret on how to overcome this problem, to save you the constant hassle of having to retune often. When you put on new strings, you need to stretch them manually, otherwise they will keep going out of tune until they stretch by themselves. There is a very simple and straight forward method of stretching your strings after changing them, which most beginners don't know about, and therefore have to retune almost each time they pick up the guitar. https://www.theguitarlesson.com/wp-content/uploads/the-guitar-lesson-logo.png 0 0 Tom - TheGuitarLesson.com https://www.theguitarlesson.com/wp-content/uploads/the-guitar-lesson-logo.png Tom - TheGuitarLesson.com2018-05-03 04:50:042018-05-03 04:50:04Strings Going Out of Tune After a String Change?